My name is Lara Oles and I am a Para Equestrian training to represent the USA on the Para Dressage Team. I have been riding horses since I was 4 years old, but a skiing accident that paralyzed my right arm and damaged my spinal cord in 2006 changed my life forever. It wasn't until I attended the World Equestrian Games in 2010 and witnessed the Para Dressage competition that I decided to start riding dressage again. In 2014, my lucky stars aligned and we were able to purchase my amazing and gorgeous super-mare, a Canadian Warmblood named Bella. The two and a half years of success I had with Bella were like a dream. At our first CPEDI*** in June 2015 at Rancho Murieta, California, we won both the Team Test and Individual Championship Test for Grade III. Then in November 2015, Bella and I placed in the top ten at the U.S. Para Nationals in Katy, Texas. By June 2016, at the CPEDI*** in Langley, Canada, we had improved enough to earn over 70% and the high overall score each day. Finally, in November I accepted the Para Rider of the Year Award - 2016 Grade III Reserve Champion from the US Dressage Federation. Tragically, Bella died suddenly on October 20, 2016. The depth of her loss is beyond words. She was a priceless member of our family, as well as a fierce competitor. Heartbroken, I was ready to quit. Then a week later, an International-quality German-bred Oldenberg horse named Wolkenpiper was donated to me so I could continue my journey. Throughout all the highs and lows, I am forever grateful to my horses for giving my life purpose. Lara and Bella competing in California, June 2015. 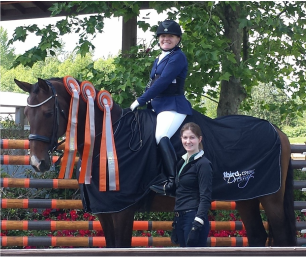 Lara, Bella, and trainer Annie Sweet after winning the Thunderbird CPEDI*** show in Langley, Canada, June 2016. Para Dressage is an extremely expensive sport and we cannot make it to the podium without financial assistance. Please become part of our Team and contribute by clicking below. We have been lucky enough to be ambassadors for these wonderful businesses. Please patronize these companies to reward their support of this underdog Para rider!